An adult Atlantic Puffin prepares to take flight from the rocks atop Bird Island in Newfoundland, Canada leaving its colony for a short period of time. With a wingspan between fifty and sixty centimeters, this adult Atlantic Puffin will take to the water for a feeding session and leave his mate with the rest of the colony for a short time. 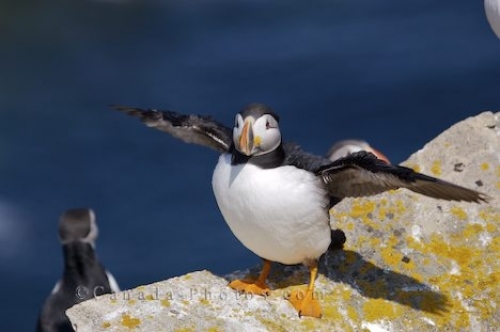 With his wings spread, the white plumage and gray coloring under his wings is easily seen as he stands with his orange legs still firmly planted on the rocks atop Bird Island in Newfoundland, Canada. The Atlantic Puffin is a much better swimmer than it is a flier as they propel their powerful wings through the water to catch small fish such as herring, sprats or sand eels. Picture of an adult Atlantic Puffin ready for take off from his colony at Bird Island in Newfoundland, Canada.